SGS Builders offers great customer service with high quality work in all types of building. We have an experienced team which gives customers the outstanding levels of service they're looking for. 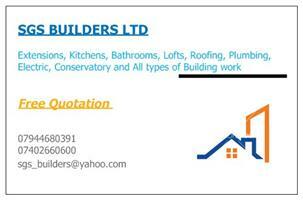 For us no job is too small and we offer free and affordable quotations for customers. Please give us a call to give you a friendly service.